What a good way to kick off February with shrimp tacos and black beans! This dinner is easy to make and healthy to eat. John sautés some shrimp and toasts tortillas over an open flame while I get together the condiments and warm the rinsed, canned black beans mixed with a half can of Rotel, some chipotle powder, and ground cumin. 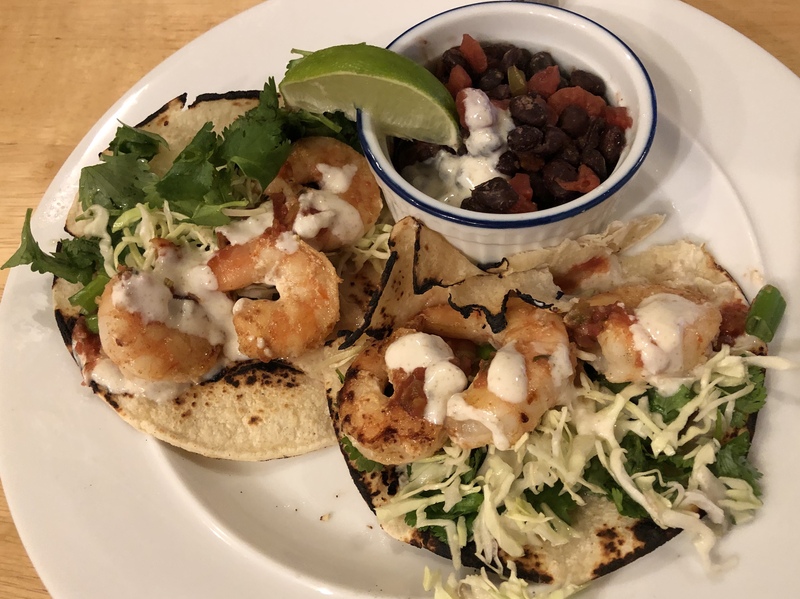 Our taco assemblage includes the shrimp, cilantro, green onions, fresh salsa, shredded cabbage, and a crema made of plain yogurt, salt, and cumin. Use the grocery store to make this simpler-canned beans, packaged shredded cabbage, and store bought fresh salsa make dinner easy! This entry was posted in Easy, Kitchen tips, Legumes, Mexican, pescatarian, Shellfish, Vegetables and tagged black beans, shrimp, Tacos. Bookmark the permalink.